Pokemon Go is adding Mew, daily quests, and a story - yes, actual plot! On March 30, Pokemon Go will receive a major update that developer Niantic no doubt hopes will evolve it from Game You Only Sorta Kinda Care About to Game You Actively Enjoy. 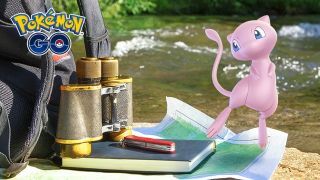 A new Legendary Pokemon, Mew, is being added to the game, and candy-hoarding Professor Willow will be sending Trainers out to complete special challenges as part of a (very light) story push. Yes, Pokemon Go is going to have a plot! Willow's quests are split into two groups: Field Research and Special Research. Field Research tasks can be found by spinning a PokeStop, and are the easier of the two. You'll receive a list of objectives to complete - such as discovering and catching certain Pokémon, engaging in battles, or successfully performing three Great!! Throws in a row - and be rewarded with items once the Research is complete. The more difficult the objective, the greater the reward. The Field Research assignments are replayable and there's no limit to how many a player can complete in a day, but they are cycled out and refreshed on a daily basis so that you're not just stuck eternally repeating the same quests. Completing a Field Research challenge will net you a stamp (with a limit of one per day). Collect 7 stamps and you'll earn a Research Breakthrough. Niantic didn't give specifics on what a Breakthrough actually entails, but teased that it may lead to an encounter with a Legendary Pokemon. Personally, I really hope that's more than just a tease. If Field Research stamps end up being a reliable way to encounter Moltres, Zapdos, Articuno, and the like, that would be a major boost to rural players who have historically struggled to participate in Pokemon Go Raids (which are currently the only way to obtain these highly-valued 'mon). If not, well, that would be disappointing, but at least Field Research sounds like a better way to engage with Pokemon Go than the mindless swipe marathon it currently feels like. As for Special Research opportunities, Niantic says that Professor Willow will present them to players via "story-driven activities". While yes, that is vague, it nonetheless reveals that Pokemon Go's world is getting a little more involved. A plot, even an extremely light one, would be a significant change for the game. Keep your eyes out for the Pokemon Go Field Research update, set to go live on March 30.